This calendula was grown from seed that was blessed by Amma, the hugging saint. The label said “Blessed Calendula,” so for a year I thought that was the common name rather than just “calendula.” And it has indeed grown as if blessed, though Anita says calendulas always do that, that we can’t really attribute their success to the blessing. Ah, well. I guess we’d have to get her to bless some Woolly Blue Curls or Bush Poppies or other difficult plant to really test it. In any case, the calendulas have done well. Two of our plants intend to overwinter themselves and go for a second year, and many of the others live on through volunteers that have come up throughout the garden. Does the blessing continue through subsequent generations? One would hope so. If you don’t know who Amma is, she’s a saint from India who blesses people by hugging them. To date, she’s physically embraced 26 million people. 26,000,000. That’s getting close to the entire population of California. And I am counted in that number; I got hugged last spring and liked it enough to get hugged again this week. For some people she is a religious or spiritual leader, but, personally, I go as a tourist more than anything else, intrigued by the ingenuousness of a master hugger. Fortunately, her events do a good job of accommodating casual visitors and devoted visitors at the same time. You have to wait several hours for your turn, but while you wait, you’re free to do pretty much whatever you want — meditate, chant, knit, read, talk on a cell phone, pretend you’re not waiting three hours for a hug, etc… — until it is your turn to queue up. Then the volunteers funnel you into the queue, and it’s then, as you move up, seat to seat and then onto your knees before her, that you get drawn into the moment. When she finally embraces you, it’s with a big strong hug, very physical, with your face pressed firmly into her shoulder, and she mumbles or chants or, in my case, makes a low trilling sound — she seems to vary it from person to person — and when you get that hug, from the hugging saint, the official guinness world record holder of hugging, you do feel as if you’ve never had a hug quite like it. I’m not usually a big one for hugs, but it’s a unique experience getting hugged by a saint, and I recommend it. This entry was posted on Thursday, November 27th, 2008 at 2:42 pm and is filed under plants. You can follow any responses to this entry through the RSS 2.0 feed. You can leave a response, or trackback from your own site. 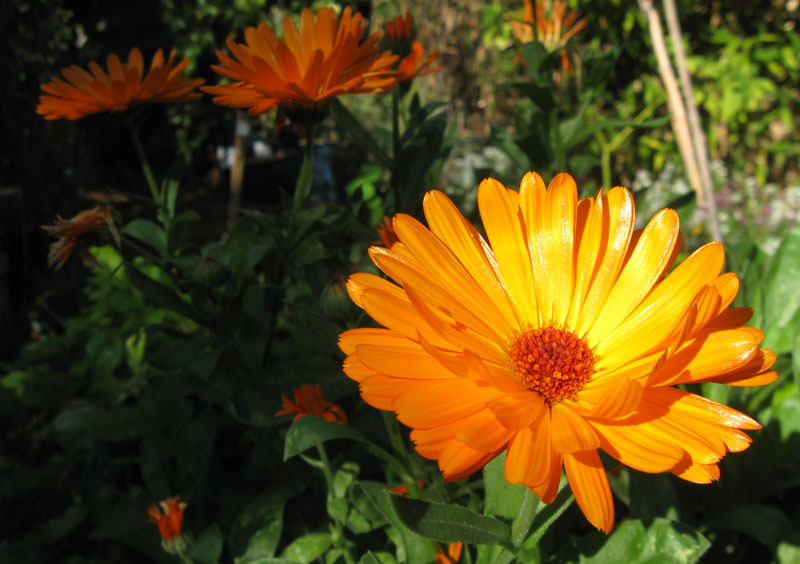 I love calendulas… they are truly blessed… so bright, easy & super cold hardy. They attract beneficial insects & are excellent cut flowers. I remember brushing a dusting of snow off them before cutting them for flower arrangements in my NM garden. They are edible too. You can throw the petals in your salad to brighten up the greens. Yum! I didn’t know calendulas were edible. I almost bought some at the nursery today. Now I wish I had. Either way, I’ll add it to my list of edible flowers.